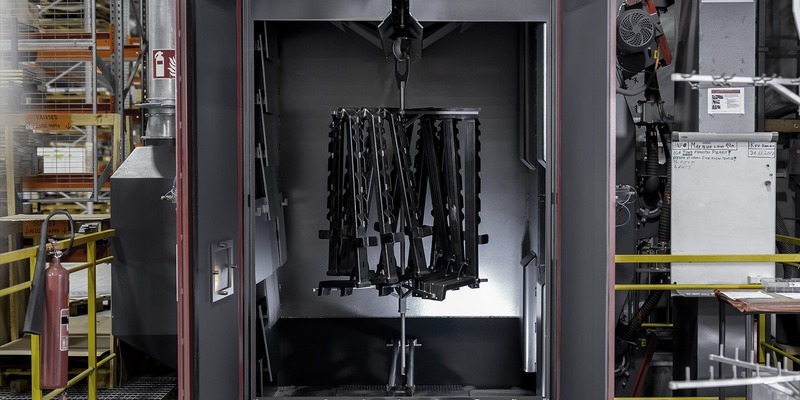 Utilizing the capabilities of our brand new powder coating facility from Aabo Ideal-Line we can provide excellent surface finish for the parts or products from different metals and alloys. As we have a 5-chamber Oxsilan® pretreatment and automated shot blasting integrated we can achieve the best possible adhesion of the coating layer. The power and free conveyorsystem offers us unrivalled flexibility and efficiency by complex product mix. For powder application we use Gema equipment that is created with high Swiss quality standards and is famous for their reliability as they have more than 40 years experience in powder coating. Our in-house powder coating facility gives us the opportunity to compete with other top-tier system suppliers for international projects. The Oxsilan® technology is an eco-friendly and by its very nature multi-metal pretreatment process. It is a state-of-the-art alternative to traditional phosphating or chromating processes. 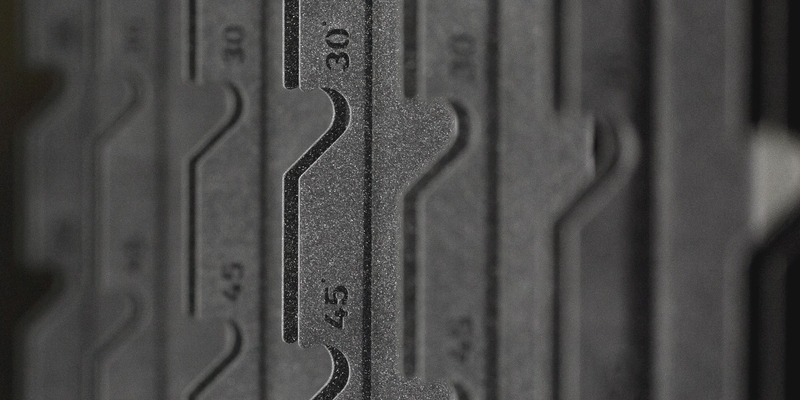 All common metals and alloys in any combination can be treated with this thin-film technology. 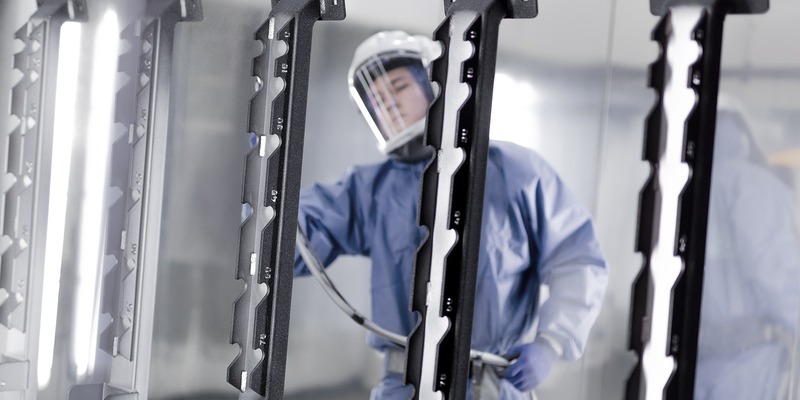 Lightweight materials such as aluminium and high-strength steel can also be pretreated with the Oxsilan® process in the same way as steel and galvanized steel. The base materials for the Oxsilan® technology are silanes. During the manufacturing process the silanes are hydrolyzed and converted to polysiloxanes. During the coating process the reactive silanol groups are chemically bonded to the metal surface as well as to the paint coating. Heat treatment following powder coating further cross-links the polysiloxanes creating layers in the range of 100 nm. In combination this is already sufficient to achieve the same degree of corrosion protection as with ten times thicker zinc-phosphating layers thereby reducing material consumption and pre-treatment times and increasing productivity: improvements of 30% and 65% can be realized in practical applications. We use the Rösler Overhead-Rail-Blast-Cleaning-Machine RHBE 17/22-L, which provides excellent surface pre-treatment for steel. It enables to achieve the best possible adhesion in coating process. The machine has variable speed control unit turbines that also enable to clean parts and assemblies from thinner materials. The rotating and an oscillation of the hook during the blasting cycle guarantees an uniform coverage and the installed frequency inverter ensures smooth oscillation of the hanged parts. The oven is divided into two separate sections – it is designed for both water drying of parts leaving the pretreatment plant and for powder paint curing after powder application. The heating of drying section is supported by using heat beaming from the uninsulated wall dividing curing side from the drying. Further all oven exhaust air leaves through the drying section before leaving the oven system to heat exchange the hot air into the process before exhaustion. This combined principle gives the optimal energy transfer efficiency and minimizes the heat loss from the oven system.